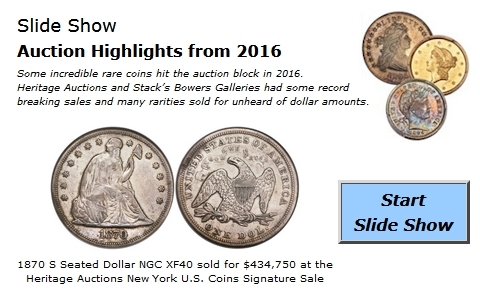 �����The coin market may not be hot, but it has been strong for key dates to rarities, along with high-grade coins that have exceptional eye appeal. As we have mentioned many times, there is plenty of money for the coins that are not often available on the market. Dealers have long lists of coins they need for their clients and the areas of the market desired are varied. Current demand is strong within most series, and, where demand is not great, sales take place on a daily basis within 10% of the current levels. This fact alone exhibits that there is depth in this market. �����Heritage has recently announced the offering of an 1856 O $20 Gold in the upcoming Long Beach Sale. This coin is an XF45+ graded by NGC and is sure to attract some inspired bidding. Over the last four years, sales for this date have been recorded from $250,000 to over $500,000 in XF to AU58. No coins have been graded above AU58. In the past few weeks, we have noticed that many coins with the new + designation, especially when it is used on a known rarity, will bring the value for the next higher grade. Dealers and collectors are looking for graded coins in old holders that could qualify for this new designation. �����Gold has been steady the past week near the $1,240 mark. One ounce Proof Gold Eagles are currently trading among dealers at $1,675. The new one ounce Proof Platinum coins are already trading at a premium ranging from $1,950 to $2,100. In this week's Moderns Wholesale Market Dealer Price Guide, the majority of changes are found in the bullion series. Most of the Gold Eagles have increased, however, the Platinum coins are a touch lower since the last Price Guide. The 2009 $20 UHR is robust at current levels in MS69 and MS70, along with coins in original packaging. Supplies appear to be rather thin versus the current demand.